This is an In Person Signed Colour 10" x 7" Photo of the American Golfer. Ben Daniel Crenshaw (born January 11, 1952) is an American professional golfer. Crenshaw was born in Austin, Texas. He attended and played golf at Austin High School and the University of Texas, where he won three NCAA Championships from 1971 to 1973. He turned professional in 1973. In 1973, Crenshaw became the second player in Tour history to win the first event of his career; this accomplishment was achieved earlier by Marty Fleckman (1967) and later repeated by Robert Gamez (1990) and Garrett Willis (2001). Following five runner-up finishes in major championships without a victory, including losing a sudden-death playoff for the 1979 PGA Championship, in 1984 he won The Masters. In the mid-1980s, he suffered from Graves' disease, a disease of the thyroid, but he continued to accumulate victories, finishing with 19 on the PGA Tour, including an emotional second Masters victory in 1995, which came a week after the death of his mentor Harvey Penick. In 1999, he was selected as captain of the United States Ryder Cup team for the matches at The Country Club, Brookline, Massachusetts. He was criticized from some quarters for his captaincy over the first two days as his team slipped to a 10-6 deficit; however, he was ultimately credited for providing the inspiration behind his side's remarkable turnaround in the Sunday singles, as the U.S. won 8 of the final day's 12 points to regain the Cup. 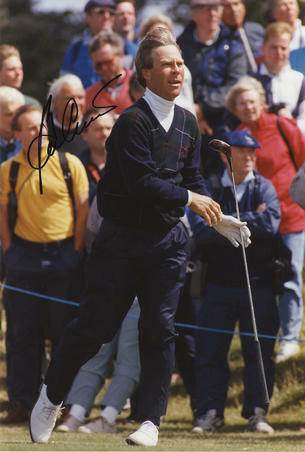 Crenshaw won several professional events outside the PGA Tour, including individual and team titles in the World Cup of Golf in 1988. He spent 80 weeks in the top-10 of the Official World Golf Rankings from 1987 to 1989.